Have you been searching on how to configure your Android device to browse the internet for long? Have you try to configure your phone before, but couldn't work due to some reasons you didn't find out then? Don't worry, here comes the solution to any issue regarding to your Android device not connecting to the internet or powering your social media apps. And how to make it work with the below MTN internet settings carefully mapped out. 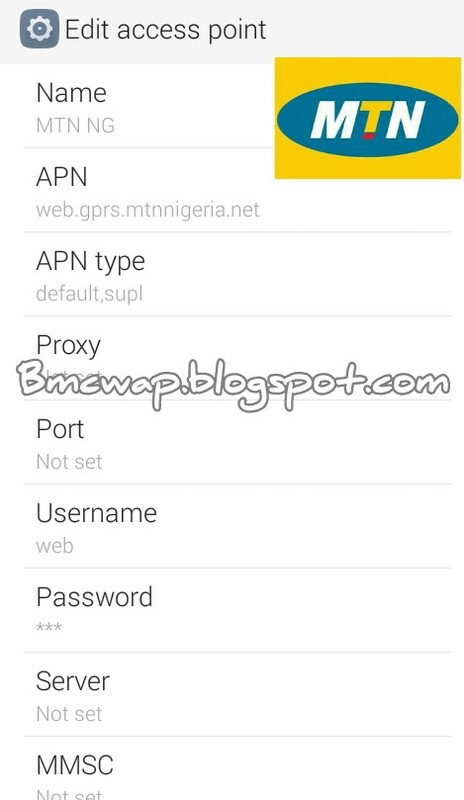 How To configure your Android Phone For Internet settings on MTN Nigeria Network. The settings can as well work for other devices and not only for Android devices. So whichever device you are using, just follow the below settings. Don't say, it is meant for Android devices alone, but follow it carefully and apply to your own device. Then, will you say it is true and I can see the magic behind it. ==>1. First thing to do, is to Create what is called Access Point Name (APN) on your mobile device. To do that, goto your phone's SETTINGS > Click on Mobile Networks >> Then, select Access Point Names >>> choose MTN if on First SIM>>>> Now, click on MENU Button and Select "New APN" which will display at the bottom of your phone's screen. ==>2. Input the below following details in the forms provided after clicking on "NEW APN"
==>3. Next, is to Save the configurarion. To do that, click on the MENU button and tap on where you see SAVE. Now, your settings are saved. Bravo!!! Your phone is now configured for MTN internet connections. Just ON your data and test the speed on browsers. You can as well on your 3G service for high speed. Happy Internet connections.